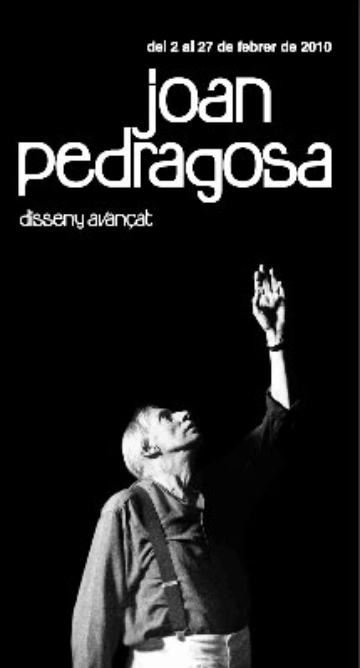 The diverse honorings to Joan Pedragosa (Badalona, 1930 - Barcelona, 2005) demonstrate the debt that the Catalan design supports with a generation of pioneers who laid the foundations of the graphical modernity in Catalonia. In case of Joan Pedragosa, the need of search of modals took him to Switzerland, where he assimilated the purity and the geometric rigor of his school. When he returned to Catalonia, this influence would make feel in his design of cartels, as 4th Prize of Drawing Joan Miro in 1965, in the typographies, as the alphabet Galaxy of 1964 edited by Bauertype in 2007, or in the first innovative works on the corporate logotypes, as those of Mobba (1956) or Fogo (1958), authentic icons of geometric rationality marked both by the essence of the calligraphy and by the almost sculptural expressiveness. Installed in his study at Tuset street, the urban Mecca of the pop, Pedragosa contributed from the design to the construction of a movement that was linking the forefront with the popular culture. He was the designer of the emblematic books of art of the publishing house Polígrafa, realized often in touch with every artist-Ernst, Miro, Clave, Picasso, Fenosa, Ponç - and he explored all the applications of the design with his posters for cultural events, the ephemeral architectures and the significant logotypes. In those years, the Catalan design was living involved in the artistic movement, since there demonstrated the exhibition 4 Gràfics (1965) in the Sala Gaspar (Gallardo, Giralt-Miracle, Pedragosa and Pla Narbona), considered the first exhibition of graphical design showed in a gallery of art in Spain. With the progressive creation of mobiles and volumetric designs, Pedragosa evolved in a natural way towards the sculptural creation. From 1990 he centers on the artistic accomplishment of three-dimensional serial works with all kinds of materials, and also works in steel of big dimensions that are exposed as sculptor's pure work, testimonies of the expressive force of the geometry formed with matter. The legacy of the creations of Joan Pedragosa's graphical design remains in the Library of Catalonia. This exhibition shows some examples of these funds as a sample of recognition and diffusion of his work.